Spotify Premium to get 'Radio' for iPhone/iPad | What Hi-Fi? The Spotify iOS update is now available for download from the App Store, so you can listen to radio on your iPhone, iPod Touch or iPad. We've just updated our iPad and it works a treat. 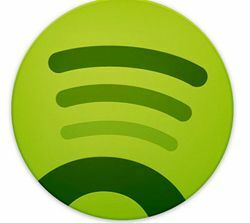 Spotify Premium subscribers will soon be able to listen to the 'Radio' feature – currently only available on the desktop client – on their portable iOS or Android device. The iOS update is expected to hit the App Store in the next couple of days, while Android support is due in a few weeks. Like other artist radio services such as Pandora, Spotify says you'll have its entire music catalogue at your disposal. Stations can be created based on artists, albums or playlists with skippable tracks. If you give an individual track a 'thumbs up' it will automatically save to a 'Liked from Radio' playlist so it doesn't disappear into the ether – plus Spotify will pay attention to your tastes and refine the radio accordingly over time. In the US the mobile radio service will be free, although listeners will have to put up with ads. As for other countries, Spotify says it's aiming "to bring a free mobile radio service to Spotify users in all countries over time, subject to licensing".